The Crary Home: Distinctive, Affordable, Independent Living. 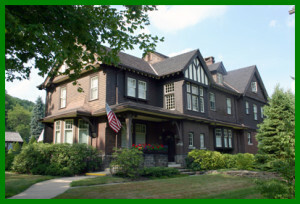 The estate of Clare and Gene Crary that is now the Crary Home resulted from good fortune in business being transferred back to the community in the form of an affordable home-like residence for well men and women over the age of 55. “His plan is to keep the present buildings (508 Liberty, The Studio, and the Carriage House) as unchanged as possible,-to create a real home, not an institution. It is an ideal location; near the hill, cool in the summer, protected in the winter and in no danger of being surrounded by other buildings. There is little traffic and yet so accessible to town. Most homes are so far out that guests feel isolated. Old folks like to be able to walk to town, browse in the shops, go to the movie. ”–Gene Crary 1965. Clare’s vision was realized when the first Crary Home residents moved into the Cottage (209 6th Ave) which was built in 1976 after Clare’s death. In 1995 the Main House (508 Liberty) and the Studio were renovated and began accepting residents. In 2002, extensive renovations to the Brick House at 504 Liberty St. were completed. Please consider a donation to the Crary Home through Warren Gives this year to help us sustain the vision of Clare Crary, the Crary Home mission, to maintain an affordable, home-like, independent living residence. Visit www.craryhome.org to learn more about the idyllic setting and services provided to residents.